A letter and a collection of construction plans that belonged to Oskar Schindler have sold at auction for more than 100,000 USD (300,000 PLN). The documents are from 1943 and 1944 and represent very rare, dated evidence of Schindler’s activities at a critical stage of World War II. 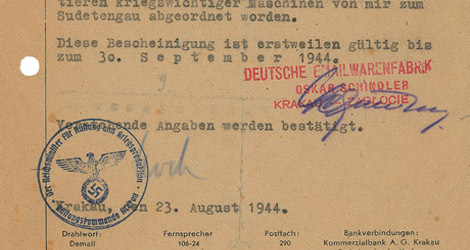 The letter, signed by Oskar Schindler, is permission for his Jewish employee, Adam Dziedzic, to go to the Sudetenland to unload and assemble war-necessary machinery. It is documentary evidence of Schindler’s plan to relocate his factory to Czechoslovakia, which allowed him to protect the workers on his list from transportation to extermination camps. The letter also includes a medical transfer document for the same Adam Dziedzic. The second lot in the online auction held by RR Auction was a collection of construction plans for Schindler’s Krakow factory. One of the folders is labelled “Siemens Bauunion,” a building contractor, and contains detailed plans for the construction of the factory itself. Some of the plans have written annotations in an unknown hand. Crowe, the author of Oskar Schindler: the untold account of his life, wartime activities and the true story behind the list, theorises that Adam Dziedzic’s medical transfer was simply intended as a safe way for him to pass between Brunnlitz (now Brněnec) and Krakow in order to collect medical supplies and food, which were hard to find in the Sudetenland. Crowe also believes that the construction plans show that Schindler intended to enlarge his factory, so that he could accommodate more workers. The successful bid for the letter was 49,279 USD and an unknown buyer pledged 52,855 USD for the construction plans.